The past few weeks I have been in a poetry in practice workshop. The focus is making poetic works of art, using poetry in art, using words in art work....... and using art in poetry. Poetic expressions happen when you leave space - for the poetic expression. The group was led by Laura A. Wellen an art critic, curator and art historian. We spent one day in the MFAH library looking at poetic art books selected by the head of the library. At the end of the class we collaborated and made a book for each person in the group and the museum requested a copy for their library. I made 12 original mono-prints from my "happy dog" series and wrote a poem. 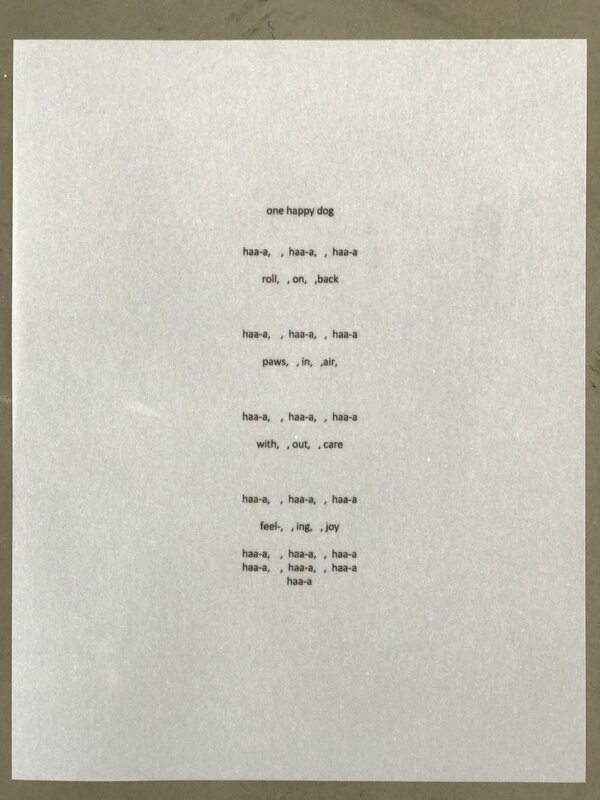 The poem is to be panted (not read) in the voice of a happy, calm relaxed dog. Each edition of our book will get one of the original prints and a copy of the poem. The title of our book is "space between". The 12 artworks and poem I contributed are below.